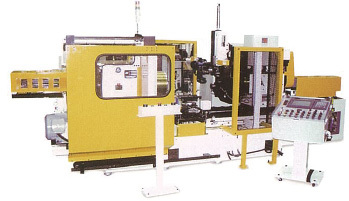 Daitoh Spinning is the only manufacturer of spinning machines in Japan. We align with the needs of our customers to cater to a wide variety of specifications, such as general-purpose machines, special-purpose machines and specialist machines. In our elastic processing as well, we're rising to the challenge of new production methods, and conducting sales activities so that more people can become aware of the unique processing method that is spinning. Spinning involves both hard and soft aspects, and the soft elements are particularly important。Our experienced staff will provide you with back-up. This versatile machine is ideal for multi-product/small-volume production. The main processing materials include iron, aluminum, copper, stainless steel, brass, Hastelloy, Inconel and titanium. 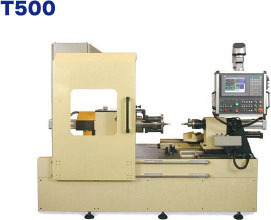 Since this is a teaching-style machine, it is easy to operate, and you can convert to numbers automatically, achieving high precision at high speeds. The main processing materials include iron, aluminum, copper, stainless steel, brass, Hastelloy, Inconel and titanium. 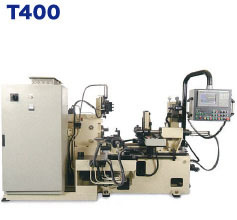 It is easy to operate, and you can convert to numbers automatically, achieving high precision at high speeds. with irregular cross-sectional shapes such as ellipses, eccentricities and polygons. small volumes, as well as for prototyping single-item special orders and for product development. The National Institute of Advanced Industrial Science and Technology and Daitoh Spinning (Co. Ltd.) have worked together in the joint development of “Linear RoboSpin”, a force-control spinning processing machine. With these features, you’ll be able to achieve irregular cross-section shapes such as ellipses, eccentricities and polygons which are difficult to achieve using conventional spinning machines. 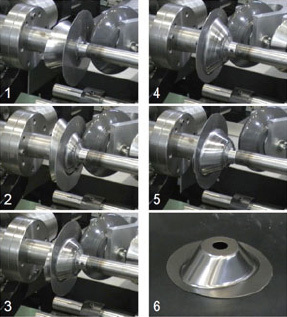 Spinning is a processing method in which rollers are pressed into rotating metal materials for elastic processing purposes. Some benefits to this include but are not limited to (1) lowered costs of molding, (2) less material waste, (3) increased processing power, smaller equipment and less noise. In particular, this demonstrates its utility in various types of multi-product small quantity production, in special orders and in prototypes, etc. 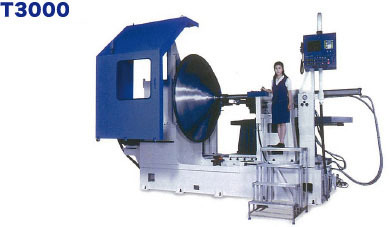 Conventional spinning machines have only been able to form products which had a circular cross-section, leaving users with no choice but to make non-circular products by sheet-metal welding or pressing, etc. 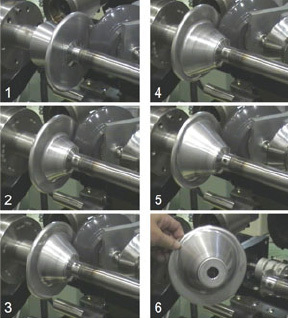 At the National Institute of Advanced Industrial Science and Technology, in order to achieve more flexible processing methods, they’ve introduced spinning processes which involve robot-controlled technology, and worked towards development of a new spinning method which allows irregular cross-section shapes to be formed (such as ellipses, eccentricities, polygons, etc.) 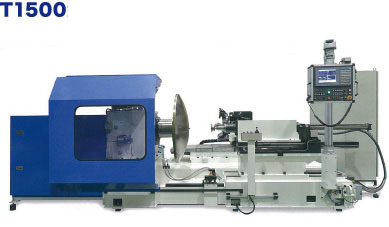 AIST worked together with Daitoh Spinning Co. Ltd., a specialist manufacturer of spinning machines, in order to bring these ideas into a reality, and taking into account more practical factors, they achieved the joint development of “Linear RoboSpin”, a force-control spinning machine using a linear motor. 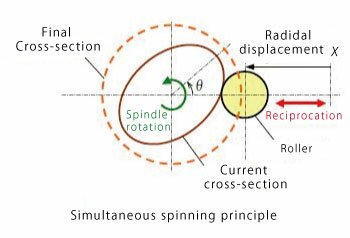 Users can create irregular cross-section shapes via two methods, “force-control spinning” and “simultaneous spinning”. 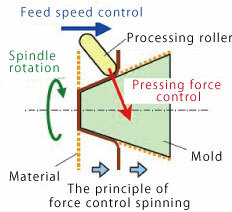 Force-control spinning uses molds with irregular cross-sections. The pressure applied by a processing roller is consistently maintained as the material is pressed into the mold. 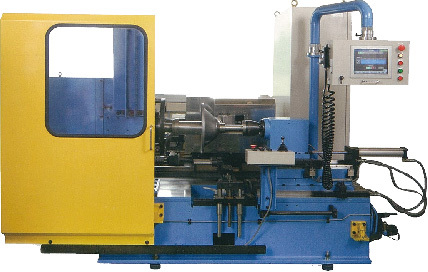 At the same time, in the direction parallel to the rotation axis, a processing roller is delivered at a stable speed in a controlled fashion. The roller moves to follow the shape of the mold, causing the material to come close to the mold. As a result, users can create products of an irregular cross-section shape which are the same as the mold. 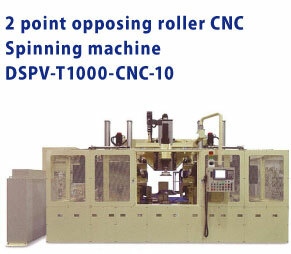 With “Linear RoboSpin”, rollers are moved by the linear motors. 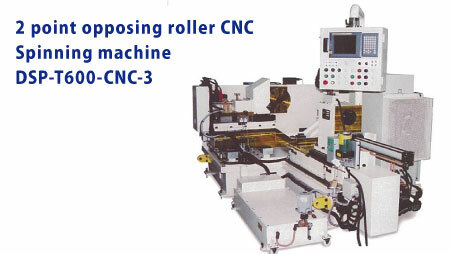 The rollers rapidly follow the shape of the mold, achieving faster results. Additionally, with a suction-force cancellation-type linear motor, frictional force reduction is reduced while thrust is increased. 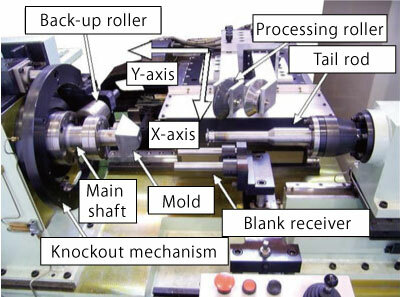 In Simultaneous spinning, the roller is controlled Simultaneously with the rotation angle of the workpiece. 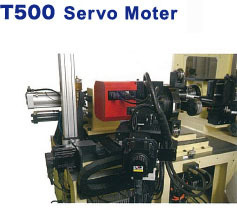 Since a servomotor is adopted as the spindle, the rotation angle of the workpiece and the position of the roller can be specified at the same time. Draw the cross-sectional shape that you want to make at the contact point between the roller and the workpiece, and form the desired irregular cross-sectional shape. 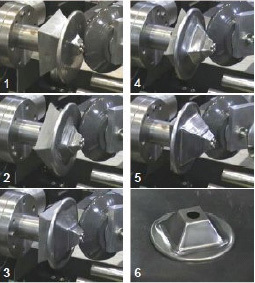 This method is particularly effective for forming pipes. Furthermore, by combining Simultaneous spinning and force-controlled spinning, you can work with shapes and materials that are difficult to form in a step-by-step fashion. With “Linear RoboSpin”, we’ve added a function that is used in conventional spinning processing machines. ◎Peripheral functions… tailstock，blank receiver，back-up roller, etc.